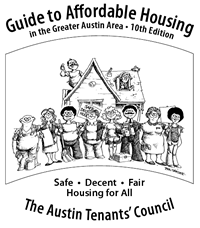 If you are in need of affordable housing in Austin, then you need to know about the Austin Tenant's Council. They publish a annual guide to affordable housing in Austin that lists all the apartment complexes in Austin that participate in affordable housing funding from the city, county, state or federal government. You can either read is online or pick it up at their offices.